60305 is rated 5.0 out of 5 by 1. 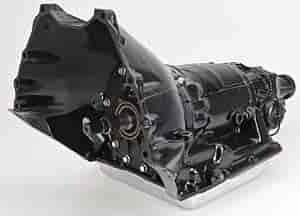 What is the max torque this transmission can handle? This transmission will hold up to 450 ft lbs of torque. Can I use on a 455 bored .030 over 1972 Pontiac engine ? Yes, this will fit your application as long as the HP is within the range of the TH350. Do you all refund a portion of the cost like the parts places do when I turn my old transmission in. I don&rsquo;t need it. We do not take transmission cores. You might try contacting a local transmission shop and see if they will purchase your core from you. why cant a person hook up the kick down cable to this transmission? Why would it void warranty? The valve body has been modified and is not designed to work with a kickdown cable. What size bolt does the transmission mount use on this?. The 2 holes on the bottom where the mount mounts. The trans mount bolt is 7/16&quot;-14. This will fit, but you may need to change the torque converter and the driveshaft.